The best trails and bike paths to take with your kids in and around Victoria. Biking as a family is a perfect way to keep active and explore different areas of Greater Victoria. Thanks the the mild climate here on the West Coast, you can really bike all year round! Admittedly, I like to call myself a "fair-weather biker" which means dry and above 15 degrees, but I sure do admire the die-hard cyclists in this city. 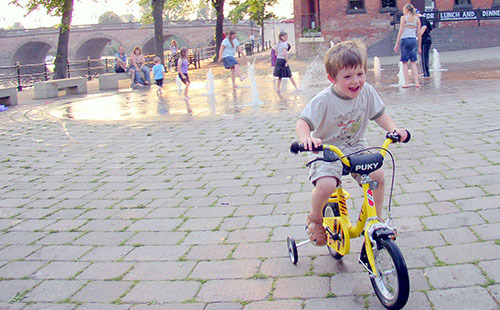 Previously, Pedalheads gave us some great information that I definitely recommend reading about buying bikes for kids. My word of advice, buy second hand when they’re still young and growing fast, but if they’re older and love biking then consider investing a little more into something that will stand the test of time and kilometres. Nothing is worse than riding a heavy bike that breaks all the time in the most unfortunate places, plus it is unsafe. The Goose, as everyone calls it, stretches all the way from downtown Victoria to Sooke, and connects with the Lochside Trail to get to Sidney. Basically, all of Greater Victoria is bike-able with this amazing trail! In the summer a ride from Saanich or downtown to Swan Lake is about the right distance (about 20 minutes) for younger cyclists and you can picnic lakeside and watch the birds and ducks. There are only a couple of hills, and as the Goose is a cycling and pedestrian trail you don’t have to worry about vehicles, except for at crossings. To challenge yourselves a little more, ride to Thetis Lake on a pleasantly warm day and stop for lunch and a swim at the lake. 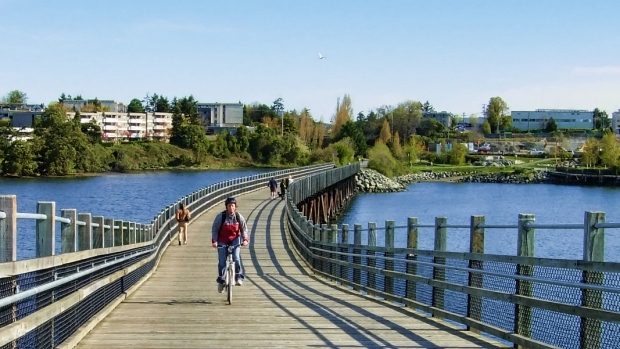 Pictured above is the Selkirk Trestle, a part of the Goose that connects Vic West / Esquimalt with Victoria / Saanich so that cyclists don't have to cross via the Bay Street Bridge. I love riding over the trestle, it's a fun change from the typical path. This actually connects with the Goose like mentioned above, and takes you from Saanich (just off Blenkinsop) and all the way to Sidney through farms and then along the ocean. It's a stunning ride! My favourite thing to do was to start in Sidney and ride to Mattick's Farm where we'd be rewarded with ice cream. Mattick's Farm is a charming cluster of shops and is a great place to take a break for an hour or two before heading back. This loop takes you all the way around the Victoria International Airport. 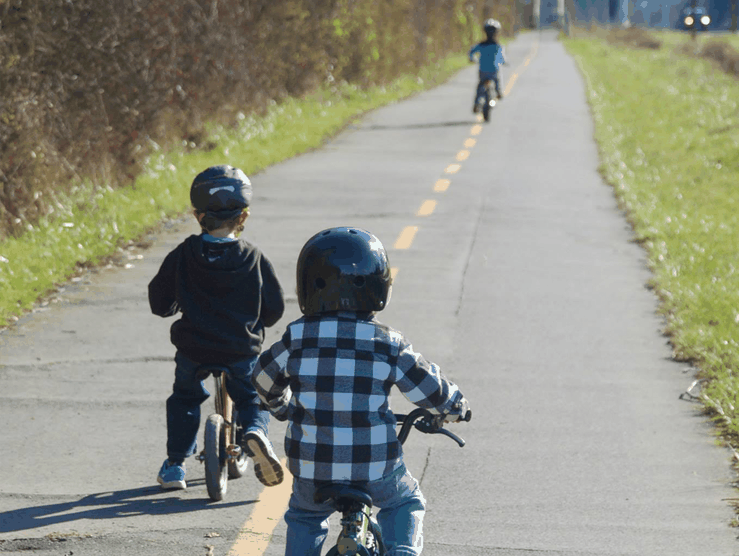 The 9.3km biking and walking path is a great way to enjoy the natural beauty of the Saanich Peninsula, is nice and easy for young kids as it is paved and mostly flat, and it's even an educational experience. Little pit stops along the way showcase interesting signs that show the historical significance of the airport and its surroundings. It can also be fun for the kids to watch the planes take off! Spring and summer are also bike festival seasons in Victoria. 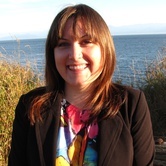 The Saanich Cycling Festival is early in June each year at the University of Victoria, and features a police-led family bike ride, bike rodeo and demos. Demos are a great way to try out different bikes and biking gear. June is the Victoria International Cycling Festival, Canada’s biggest biking celebration. Several events take place throughout the month, including races and the super-cool BearTrax (formerly known as Jump Ship) contest at Bear Mountain, where they freeride mountain bike and show off some amazing tricks. It is a free family-friendly event on August long weekend with a kids zone, vendors, food trucks, live DJ, and more. And don’t forget Bike to Work Week, or in family-world, Bike to School and then Work Week. From May 28 to June 1 show your kids how easy, fun and environmentally-friendly it is to bike to school. Bike to Work Victoria holds workshops on bicycle safety and fun events throughout the week to get your kids involved in. For parents: during the week there are coffee and treat specials for participants too! The annual event that takes over Douglas Street for the city’s community celebration with vendors, music, and much much more. Car Free YYJ celebrates alternative transit, so they offer bike valet parking on Pandora, east of Douglas. Try not to drive to the event, but ride your bikes along the new bike lane on Pandora, and park it so you can enjoy the festivities! If you have little daredevils, then why not get in on a youth group mountain bike ride with the South Island Mountain Bike Society! This is for kids aged 10 to 15 and takes place every second Sunday at Hartland (Mount Work Regional Park). Wheels in Motion also does mountain biking programs at Hartland, where kids 12 to 16 learn off-road cycling skills and maintenance. Your kid should have protective equipment, gloves and a bike in good repair (and that can stand a little battering) for the mountain bike park. We are so lucky to live in a city where you can bike year-round, though it’s a little chilly in the winter months. Biking with kids in Victoria is a great way for the whole family to be active and while initially it costs a bit to buy all the gear, you can enjoy it for free thereafter!